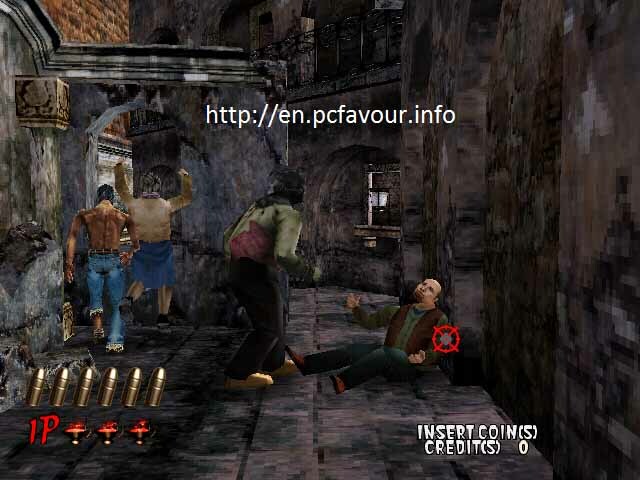 Download The House of the Dead 2 game free for PC. It is first person shooter horror game. In this game, you have to survive people from dead men. These dead men are affected by a virus. The House of the Dead 2 is the sequel of The House of the Dead arcade game. The House of the Dead 2 has several modes to play. You have to control the game with mouse and its clicks during gameplay while to start game, you have to use keyboard buttons. The modes are arcade, original, training and boss mode. Arcade and original modes are same. You do not need to take your player forward because it will works automatically in the house of the dead 2 game. You have to focus the target and then shoot using left click from mouse. If you have run out of bullets then reload it using right click. The game has several levels about 7 to 8 or less. At every level, you have to shoot dead men and try to survive live people. Some people will bless you with life after securing. At the end of each level, you will have a battle with a boss. For example, at the first level, the boss is Judgment. It is a flyer flying here and there with a guard. Your pistol fire will not hurt the guard and it is very difficult to target the flyer. Then how you will shoot? You have to wait for and keep an eye on guard. When he ready to attack on you with his axe, you will see fly hanging still in the air. This is the time to target the fly before the guard raises his axe. When you shoot the flyer, guard will lose his balance and the scene will start again. Similarly, in the second level you will face another boss and your fire will hurt him only when you will fire into his open chest. From game menu, you can change the credit continuity from 1 to 9. You can get the life up only for maximum of 9 times. After this, the game will be over. You can also change the target symbol.